Last weekend we went to Bilbao as in 6.2 we will study El Otro Árbol de Guernica, which is primarily based in Bilbao. We walked through lots of the streets and plazas that appear in the book. We all took lots of photos as Melanie Jimenez (Bedales Head of Spanish) summarised the relevant parts of the book. It was extremely helpful to have this deeper background information and I now can’t wait to read the book! We went to the Museum of Peace which offered lots of facts and stories about the Spanish Civil War, which is when the book is set. There, we sat in a room whilst an audio played of a woman telling a heart-breaking story about the struggle of war. This was prominent as the two protagonists in the book – Santi and his sister Begoña – were evacuated and probably went through a similar experience. That same day we also went to visit the tree after which the book is named. We learnt that it was there that all the important decisions were made and that the officials made their vows to the villages and laws of Euskadi around that very tree. There, there was a beautiful building where the decisions took place and it also displayed a stunning stained-glass ceiling. During the trip we went to many eateries that boasted traditional Spanish food. We tried croquettes, Spanish ham and churros just to name a few. On the last day we visited the Guggenheim museum which was a brilliant way to end a great weekend. In pairs we strolled around whilst admiring the works of Cezanne, Picasso, Giacometti, Van Gogh and many more. Overall it was a trip that none of its participants shall forget, I just hope they do it again next year so I can do it all again! Bedales celebrated impressive exam results on GCSE results day with over half the grades awarded at A* or A. Unlike any other school, Bedales students tailor their studies by choosing a combination of GCSEs, the more challenging IGCSEs, and the school’s unique GCSE alternative, Bedales Assessed Courses (BACs). All three qualifications use the same A*-G grading system. This year’s cohort achieved 29% A* grades, higher than any of their predecessors since the current curriculum was started in 2008. The content of BACs is broad and stimulating offering cross curricular opportunities that are suited to a wide variety of learning styles. Internal assessment includes a mixture of written assignments, presentations, projects and performances, together with terminal examinations as appropriate. Bedales is the first school to be recognised by UCAS as offering its own GCSE-replacement qualification. 12 Bedales students achieved a minimum of nine A* grades; three of those achieving 11A*s and three achieving 10A*s. In total 21 students (from a cohort of 92) achieved a minimum of nine grade A*/As. Lili Bidwell from West Meon, Poppy Duncan from Stroud and Juliette Perry from Petersfield all achieved 11A*s. Chloe Green from Liss, Robert Miller from London and Phoebe Noble from Chichester all received 10A*s. Lili obtained A*s in Bedales Assessed Courses Classical Music, English Literature and Philosophy, Religion & Ethics, IGCSEs in Mathematics and Triple Award Science, and GCSEs in English, French, History and Spanish. Poppy achieved her A*s Bedales Assessed Courses in Classical Music, English Literature and Geography, IGCSEs Mathematics and Triple Award Science, and GCSEs in English, French, Latin and Spanish. Juliette received A*s Bedales Assessed Courses in Design, English Literature, Geography and Philosophy, Religion & Ethics, IGCSEs in Mathematics and Triple Award Science, and GCSEs in English, French and History. Twins Emily and Natasha Blackley from Priors Dean achieved a total of 18A*s and 4As between them; nine A*s and 2As each. They both achieved A*s in their Bedales Assessed Course in Geography, IGCSEs in Mathematics and Triple Award Science, and GCSE French, as well as an A in GCSE English. 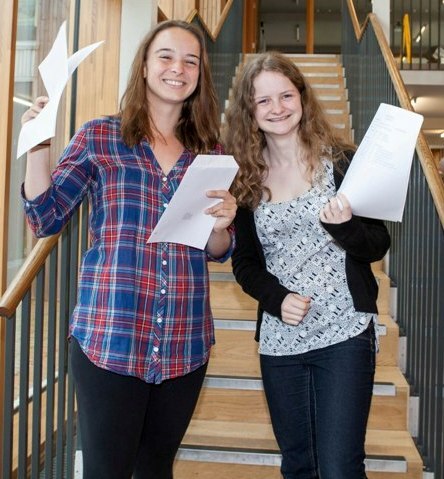 Emily also received A*s in her Bedales Assessed Courses in Ancient Civilisations and Dance, and GCSE Spanish, and an A in GCSE History, while Natasha obtained A*s in her Art, Design and English Literature Bedales Assessed Courses and an A in GCSE Latin. Oscar Braun-White from Rowland’s Castle achieved 9A*s and 2As. Phoebe Landers from Headley achieved 9A*s and 1A. Jojo Mosely from Hambledon achieved 9A*s and 1A. Sophia Falkner from London achieved 9A*s.
Sofie Kitts from Swanmore achieved 8A*s and 1A. Ally Swain from Sevenoaks, Kent achieved 8A*s and 1A. Lizzie Compton from Rake achieved 7A*s and 3As. Jack Shannon from Steep achieved 7A*s and 3As. Maya Wilson from Rowberrow, North Somerset achieved 5A*s and 4As. Ellie Soper from Hambledon achieved 5A*s, 4As and 1B. Hux Chambers from London achieved 3A*s and 6As. Roly Botha from the Isle of Wight achieved 2A*s and 7As. Margaret Rice from Bampton, Oxfordshire achieved 1A*, 8As and 1B. Bedales Assessed Courses are externally moderated and recognised by UCAS. Bedales’ unique curriculum is built around a group of five compulsory subjects: IGCSEs in English, Mathematics, Science (Double or Triple Award) and a Modern Foreign Language (the 2013 cohort was the last to take GCSEs in English Language and a Modern Foreign Language). This ensures both that the full range of core skills is covered and also that the minimum requirement for much of higher education is met. Students then choose from other options, which include up to five BACs from a total of 11 courses on offer that include subjects such as Ancient Civilisations, History and Classical Music, an additional IGCSE Modern Foreign Language or GCSEs (e.g. Latin or Computing). As Bedales students study a combination of three different qualifications, the figure quoted is a combined statistic for GCSE, IGCSE and Bedales Assessed Courses. No other school studies this unique combination of qualifications. Data is provisional. Read more about exam results. 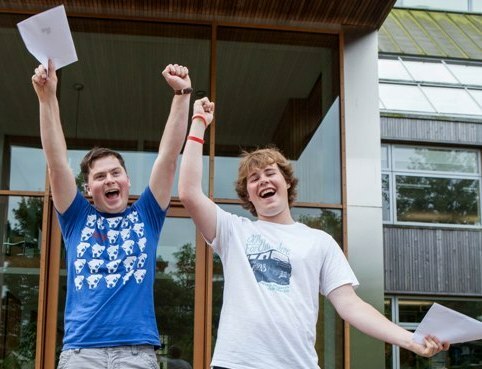 Bedales students have achieved strong A Level results for 2013 with 40% of all grades at A*-A. They have secured places at universities including Oxford, Cambridge, Edinburgh, Exeter, Bristol, St Andrews, York, Warwick, Leicester, Leeds, Manchester, Kings College London, University College London, Imperial College London, Plymouth, Aberdeen, Swansea, Sheffield, Nottingham and Brunel, art colleges such as Falmouth University, Arts University Bournemouth, City College Brighton, University of the Arts London and UCA Farnham, as well as international institutions including New York University. Six Bedales students have secured places at Oxford and Cambridge; four have done so through this summer’s grades and two former students received unconditional offers. Sam Wilkinson from Midhurst, who will read Physics at Oriel College, Oxford, received his results today having spent the summer working as a Data Scientist for NASA in collaboration with their team which is based at the Johnson Space Centre in Houston, Texas. Sam achieved four A*s in Chemistry, Physics, Mathematics and Further Mathematics, and an A grade in Biology. Katie Millard from Hambledon will read French and Linguistics at Keble College, Oxford after achieving 4 A*s in Chemistry, Latin, English Literature and French. Maddy Green from Liss will read Medicine at Murray Edwards College, Cambridge after achieving three A*s in Biology, Chemistry and Mathematics, and an A in Further Mathematics. Nell Whittaker from Shrewsbury will study English at Fitzwilliam College, Cambridge after achieving an A* grade in English Literature and two A grades in Latin and History. Former student Christy Callaway-Gale from Petersfield will read Spanish and Linguistics at Oriel College, Oxford after achieving three A Level A* grades last summer. 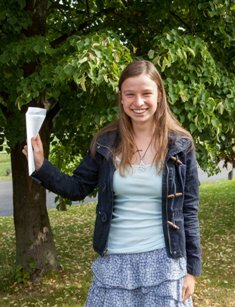 Rosie Nicolson from Cranbrook, Kent will study Architecture at Cambridge, having gained three A Level A* grades at Bedales in 2011. Three of the students, Christy, Sam and Maddy, were taught at Bedales Prep, Dunhurst, before progressing to Bedales senior school and sixth form. Two students; Georgina Gulliver from Buriton and Deputy Head Girl, Katie Shannon, from Steep will both go on to read Architecture at the University of Manchester and the University of Edinburgh respectively. Georgina achieved two As in Art and Mathematics and a D3 in Music Pre-U. Katie achieved three As in Art, Design and Mathematics, and a B in Physics. Tim Jones from Dorking will read Mathematics at Imperial College London after achieving three A*s in Chemistry, Mathematics, and Further Mathematics, and an A grade in Physics. Joe Pemberton from Chichester will also read Mathematics, but at the University of Warwick, after achieving two A*s in Mathematics and Further Mathematics, an A in Latin and a D3 in Music Pre-U. Lucy Waterhouse from Midhurst achieved two A*s in Drama & Theatre Studies and History, and an A grade in English Literature and will read History of Art at the University of Bristol. Evie Cullingworth from Downley, Buckinghamshire achieved two As in English Literature and Drama & Theatre Studies, a D3 in Music Pre-U and will study Drama at New York University. Felix Conran from London is delighted to have secured a place at the University of the Arts in London to study Product Design and Arran Stamper from Preston, Lancashire will read Illustration at the University of Edinburgh (after achieving two A*s in Art and Russian, and an A grade in Design). This is a particular achievement for both these students as it is rare for Art and Design students to be offered places on such prestigious arts degree courses without having first completed a Foundation Diploma year. This was because their work was of such a high calibre. Although both receiving university places, Archie Howes from Ropley and George Veys from Guildford have decided to set up their own business, Darkroom Productions, an event management company providing the sound and lighting for festivals, concerts and corporate events. 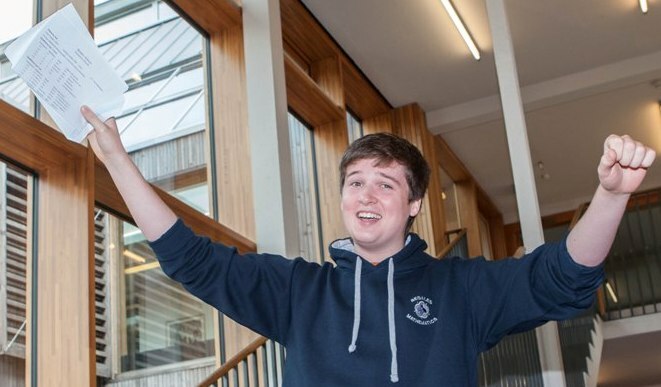 Sebi Bacon from Steep achieved two A*s in History and Mathematics, and an A grade in Physics; to study Economics at University College London. Georgia Green from Steep achieved an A* in Drama & Theatre Studies and two A grades in English Literature and Spanish. Elize Layton from London achieved an A* in Drama & Theatre Studies, and two A grades in Dance and Religious Studies. Piper Anderson-Klotz from London achieved an A* in Art, an A grade in French and a B in Classical Civilisation. Toby Matimong from Southsea achieved an A* in English Literature, a D2 in Music Pre-U, and a B grade in Biology. Egor Platon from Chisinau, Moldova achieved an A* in Russian and two B grades in History and Mathematics. 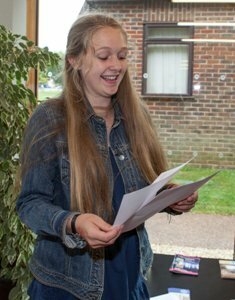 Jessica Sankey from Petersfield achieved an A* in English Literature, and two B grades in Classical Civilisation and History; to study English at the University of Sussex. Reuben Thompson from London achieved an A* in English Literature and two B grades in Economics and Geography; to study Geography at the University of Exeter. Anna Brown from Liss achieved three As in Biology, Physics and Geography. Scarlet Watney from Bosham achieved three A grades in Design, Economics and Mathematics. Georgina Brand from Petersfield achieved two As in Design and Psychology, and a B in English Literature; to study Fashion Communication at Northumbria University. Anna Jacobs from West Meon achieved two As in Biology and History, and a B grade in Mathematics. Sophie Grierson from London achieved two As in English Literature and Drama & Theatre Studies, and a B grade in Classical Civilisation; to study English Literature at the University of Leeds. Oscar Cooper (Head Boy) from Southsea achieved two As in Economics and History, and a B in Mathematics. Bethany Maskall achieved two As in Biology and Chemistry, and a B in Drama & Theatre Studies; to study Biochemistry at the University of Sheffield. Mohammad Pechuho from Karachi, Pakistan achieved two As in English Literature and Religious Studies, and a B in Classical Civilisation; to study Classical Studies at the University of St Andrews. Talia Pick from Chichester achieved two As in English Literature and Drama & Theatre Studies, and a B in History. Charlotte Robins from Winchester achieved two As in Biology and Mathematics, and a B grade in Physics; to study Natural Sciences at the University of Exeter. Eleana Wilson-Smith from Midhurst achieved two As in Religious Studies and Spanish and a B in Art; to study a Foundation Diploma in Art & Design at Arts University Bournemouth. Oliver May from Lymington achieved an A in French, and two B grades in Biology and Chemistry. Neal Raithatha from East Meon achieved an A in Mathematics, and two Bs in Chemistry and Economics; to study Mathematics at Loughborough University. Izabela Swiderska from Petersfield achieved three B grades in Design, Psychology and Spanish; to study a Foundation Diploma in Art & Design at University College Falmouth. Cambridge Pre-U D1and D2 grades are equivalent to an A*; a D3 is equivalent to an A; M1 is equivalent to an A grade and M2/M3 merit grades are equivalent to B grade. Please note that this data is provisional and subject to re-marks.